Stanwell Park Physiotherapy can provide first class, prompt service to your patients. 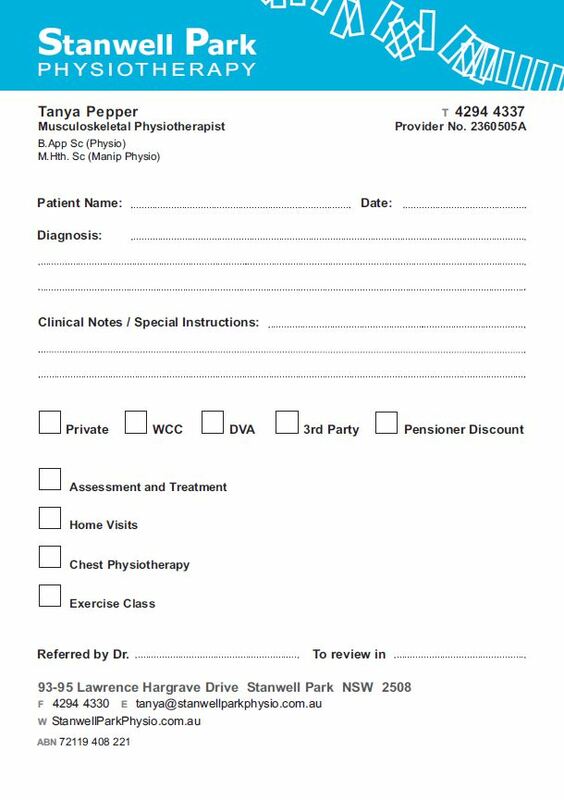 You can download and print a referral form or please complete below for pads to be delivered to you. You are also welcome to contact us on 4294 4337. I have worked closely with Tanya for 8 years. She is an outstanding physiotherapist. She spends 45 to 60 minutes with each patient which is mainly hands on therapy. This leads to great results. I send her all my trickier cases and the majority of the time she is able to improve their symptoms in a few sessions. She is particularly good with chronic neck and back problems which are all too common and many of my patients find that a semi regular visit keeps their symptoms well controlled. Tanya advocates exercises and healthy lifestyle as an adjunct to her therapy which I agree with. All my family have seen Tanya as patients with great results. I see her regularly for a chronic neck problem and find the therapy very effective.